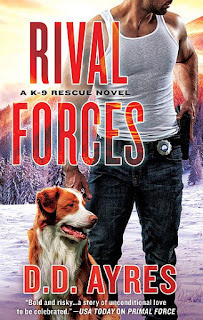 Rival Forces is the fourth installment of D. D. Ayres' K-9 Rescue series. The high-pitched shriek warned Kye McGarren of an incident taking place on ski slope three. He shifted the view in his field glasses in time to see a female skier plow into a snowbank that formed one edge of the slope and tumble headfirst onto the other side. Kye lowered his glasses to find his ski patrol partner for the week, Joe Saunders, grinning at him from their perch at the top of the slope. “I’m cutting you slack, old man. She looks hot. Kye grunted. At thirty-six, he was hardly old. Moreover, it was against company policy for staff to socialize with guests. Not that he would bring that up here. Technically, Joe had seniority. What Joe and the SAR squad members didn’t know was that they worked for Kye. “Call it in. I’ll sit second until the EMS guys get there.” Kye adjusted his goggles and then picked up Lily, his SAR K-9, and slung her across his shoulders. Lily, a forty-pound Nova Scotia duck tolling retriever, often called a toller, confidently straddled Kye’s shoulders. Ski patrol dogs often piggybacked with their handlers to their target. Kye grabbed his poles off the edge of his snowmobile and pushed off down the hill in a silky swoosh. Lily barked, a bright eager sound that from a distance sounded a bit like a coyote. Often mistaken for small golden retrievers, tollers had bright-red fur but possessed higher energy and intelligence. With a white blaze down her chest, a rosy-pink nose, and a narrow wedge-shaped head like a fox’s, Lily looked dainty. But she was as tough as a wolf, with the balance and agility of a mountain goat. No terrain was too tough or too steep. She also had a nose that could pinpoint human scents buried beneath several feet of dirt, mud, water, or snow with equal ease. He came up on the group of skiers who had paused at the edge of the slope where the female skier had gone off into the rough a little faster than necessary. They were laughing and taking pictures with their cell phones. “Move back. Now.” Kye’s commands instantly parted the gawkers. With her flag of a tail held high, Lily barked twice as she plunged over the berm. SAR dogs worked off the leash in snow. It allowed them to cover search territory much faster than a slower-moving human could. In an avalanche situation, seconds counted. Even as Kye dug his poles in the ground and kicked off his skis, Lily was barking in a key that meant she had found something. The skier, in a bright-pink parka, was about ten feet beyond the edge of the slope, skis and poles scattered in the snow. She was kneeling in unpacked powder, and digging. If the volume of her curses was any indication, she was okay. Available for pre-order for November 1 release! A veteran author of romance and women’s fiction, D.D. Ayres now writes Romantic Suspense, and loves it! She believes the lure of romance is always the human connection. Put that connection in physical jeopardy, and we learn a bit more about who we really are. I love Ms. Ayres K-9 series. Each one is filled with suspense and romance in perfect harmony. I haven't read any books of this series yet. Thank you for this post as it made me aware of them. Adding it to my TBR! I love this series! 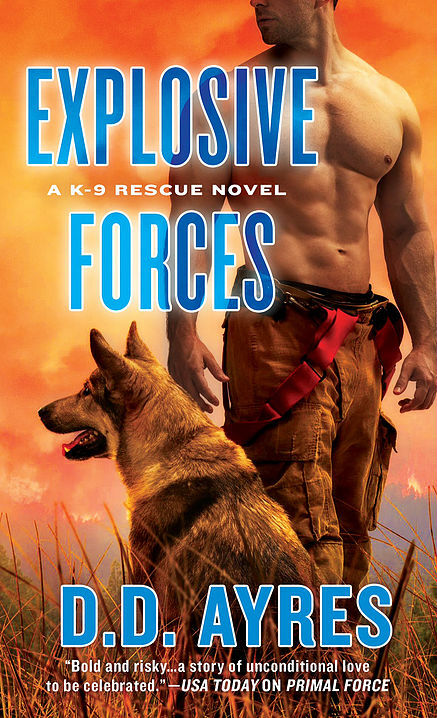 It really shines a light on K-9 training authentically while at the same time balancing romance and suspense. Ayres has done a wonderful job with this series.